SYNOPSIS: Who would you become if you lost the only person who ever mattered? For twenty-six year old Dylan Hopkins, the answer is easy. He’s become no one. Memories of the happier times are all he has left as he finds himself meandering numbly through his now dull life. Though he cares about his work and family dearly, he’s yet to let himself find love again. Afraid of letting go of what he once had, Dylan chooses to keep his heart buried, where it belongs, having died a long time ago. Conner Michelson is about to change everything Dylan knows. He’s every bit the bad boy persona - tatted up, ex-MMA fighter, but after an injury leaves him unable to fight, he has to rethink his goals. Having just opened his own gym, Conner can cross his first major life accomplishment off his very short list. Next up: find a man he can settle down with and build a family. Seems simple enough - a dream most people have, but when he meets Dylan, his carefree, easy-going life is thrown into a tailspin. Determined to keep Dylan in his life, Conner vows to resurrect Dylan's long ago buried heart and let love live once more. Here's what people had to say about Let Love Live: "Let Love Live is a beautiful, yet heartbreaking tale of a man falling in love, losing love and finding it again." -Christy "What a story! I lived it, breathed it and completely fell in love with this book and this author. 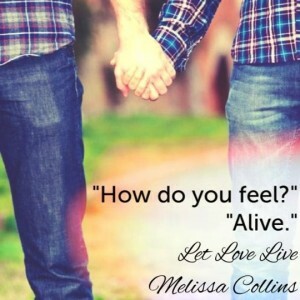 Melissa Collins has definitely gained a new fan because I am hooked!" -Jen "Wow. A book hangover isn’t something that happens to me very often, even from my very favorite reads. But Melissa Collins gave me one hell of a hangover." -Mo If you'd like to stay up to date on all things Melissa Collins, join her Facebook group or sign up for her newsletter.